Eric Schmidt, executive chairman of Google, says that the often frosty relationship between his company and rival Apple is slowly defrosting. Over the last year, the two tech titans have been involved in "lots and lots" of meetings. The executive made his comment during the annual Allen and Co media conference in Sun Valley, Idaho on Thursday. 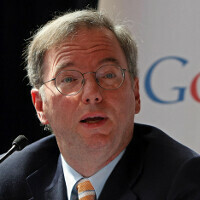 According to Schmidt, Google and Apple are involved in "constant business discussions on a long list of issues." The Google executive once sat on Apple's board during the development of the Apple iPhone and Apple iPad. That seems like eons ago, before Google's Android OS became the global leader powering smartphones. Apple didn't help the relationship when it decided to drop Google Maps and YouTube on iOS 6. Apple Maps, which was going to replace Google Maps on the platform, suffered through a poor launch and Google Maps ended up updating its new app in the Apple App Store. YouTube was removed because Google wanted to be able to put mobile ads up on the app. Apple actually did Google a huge favor. With Apple removing the YouTube client from iOS 6, it allowed Google to sell mobile ads on a new version of the YouTube app made available in the Apple App Store. Will this be the start of a new era of peace in the mobile industry, or is it the calm before the storm? Who can forget the comment made by the late Steve Jobs to his biographer, Walter Isaacson, "I will spend my last dying breath if I need to, and I will spend every penny of Apple’s $40 billion in the bank, to right this wrong. I’m going to destroy Android, because it’s a stolen product. I’m willing to go thermonuclear war on this." I really hope this, "Thermonuclear War on Android" ends soon, because it was such a stupid thing to begin with. Competition is a good thing, Android took some inspiration from iOS in the beginning and iOS is taking inspiration from Android. Making both OS's better. Your last sentence, That was lovely. Their relationship got cold over the Samsung suit, but frankly, those patent claims look ridiculous in 2013, especially after iOS7 borrowed so many ideas itself. So in the end, both realize there's no reason to go war over these things, Apple is still dominantly a HW selling company and Google as an ad revenue corporation isn't their #1 rival, so it's better to be on the same Page. All Apple had to do to win me over in this war was make a phone that I like more than my Android phone. So far, that hasn't happened. This is one of the reasons I liked hearing Tim Cook was going to be Steve Jobs's successor... As a supply guy I'd think he'd be a little more practical & logical in his approach. Detractors would blame him for Apple's continued litigations, but I'm sure that's been more or less spurred on by the remnants of the Jobs faithful remaining within the company; board of directors and executives, etc. Honestly, it's more than possible to be competitors and still be civil and even work together when it makes sense. A more amicable relationship between Apple and Google is great for the consumer, as they can focus more time and resources on better products, rather than mud flinging.